But at least I have cute and furry company. Next Next post: A NEW take on "just one less"
aaaah! anything I can do? Email me or call. ah, I’m so sorry that you’re all sick. 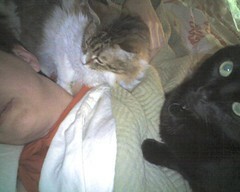 I hope the cats absorb all the nasty energy from you (that’s what they’re good for) and you start feeling better soon.